Sometimes you come back home tired from work and you smell this odor, which you know that shouldn't be there, well that's your upholstery's way to say they want to get clean. You might see some stains or discolored on the furniture too, don't worry. 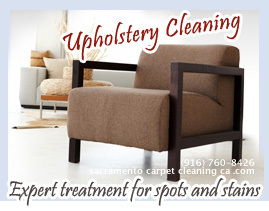 Upholstery cleaning Sacramento is here and we will help you. 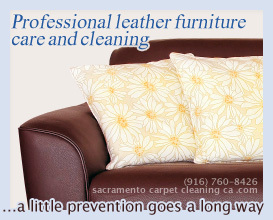 We specialize in leather, microfiber and basically any other type, just give us a call (916) 760-8426 and we'll make sure you feel comfortable in your home again. Most people underestimate upholstery cleaning, we believe it should be at the top of your priority. You may not see the dirt and dust on your upholstery but it's there and it is very important for you and your health to clean it. Think about it, these are probably the most used items in your house. You sit on them for hours while watching TV or just resting after a long day, some even like to eat on them. Therefore it's naturally that dirt, hair, skin cells, crumbs and mainly dust will gather over the years. When we arrive to a house the first things we do is diagnose the fabric and fibers type of the furniture, because every type requires different treatment. Then we start by vacuuming to remove ground and dust while using the appropriate attachments to prevent any damage to the upholstery. Step two is wash it with a precondition & shampoo this loosens up the soils and makes it easier to take it all out later when going the next level, which is a hot water rinse tool designed to flush out all the loosened up soils and soaps we used before. After the fabric is dried we will then apply some fabric protector to maintain the work that has been done. This treatment will leave your upholstery clean, soft and without the odors it had before. So what are you waiting for? 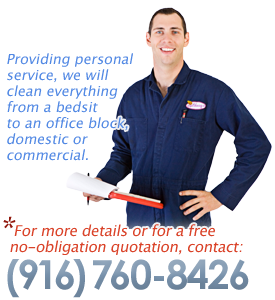 Give us a call (916) 760-8426 and Upholstery cleaning Sacramento's professional staff will be happy to help you with any kind of problem.